Cow politics, Sabarimala stance: Is India’s grand old party retreating from Nehruvian ideals? The Congress’s manifesto for the Madhya Pradesh elections would have made Jawaharlal Nehru, whose birth anniversary it happens to be today, November 14, squirm with embarrassment, especially the portion about the commercial utilisation of gaumutra (cow’s urine). Nothing defines the antediluvian, unenlightened mindset of the Hindutva brigade more graphically than its obsession with the cow. Hence, its advocacy of a concoction called panchgavya — comprising cow dung, cow’s urine, curd, ghee and milk. According to the Union minister for science and environment, Harsh Vardhan, “scientific” experiments are being carried out to test the therapeutic virtues of the saffron camp’s favourite meal. It’s a relief that the Congress, which is expected to adhere to the first prime minister’s preference for the development of a scientific temper, hasn’t batted for panchgavya as well, confining its liking to only one of the five ingredients of the gooey repast. But the party’s intentions are clear. It is beating a hasty retreat from its earlier avatar of a “Muslim party”, as Sonia Gandhi ruefully acknowledged how the supposedly damaging label had struck to the party. The reason why this has happened is no secret. It was the result of the injudicious steps of Rajiv Gandhi to overturn as the prime minister the Supreme Court’s Shah Bano judgment at the behest of Muslim fundamentalists inside and outside the Congress. That gave a golden opportunity to the BJP to paint the Congress as a party of Muslim appeasers. However, the Congress’s latest endeavours to undo Rajiv Gandhi’s mistake are not so much a course correction as a headlong retreat which can hurt the party as much as its earlier flawed policy did. Such backtracking can give the impression, first, that the party is so scared of its opponent’s supposed plus points that it is trying to acquire them without considering whether they fit in with the Congress’s longstanding image of a secular, centrist party and, secondly, that its imitative policy means that it doesn’t have a line of its own. 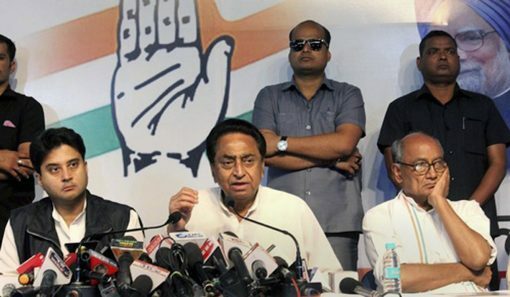 In the process, the Congress runs the risk of confusing and alienating its traditional supporters who want the party to stand for a modern India in sync with the 21st century which will be more at home with the concept of artificial intelligence than gaumutra. There is nothing wrong with the idea of setting up gaushalas or cow shelters under village panchayats or providing nursing facilities to injured cows. But it would bet to cater for all animals rather than single out the cow in a vain attempt to woo the BJP voter. It is noteworthy that while waxing eloquent about the cow, the Congress has maintained a deafening silence on the consumption of beef. Does the Congress want to follow in the BJP’s footsteps to turn India into a vegetarian country, close down abattoirs and ban beef export? The party has also been noticeably silent about its stance on economic reforms, which was its sole policy initiative in the 1990s and which has since been appropriated by Narendra Modi although he has not been bold enough to push ahead with them for fear of being dubbed pro-capitalist. The Congress, however, needs to clarify its position on the subject, especially when its proposals for loan waivers if it came to power suggest that it will like to follow the path of populism with which Sonia Gandhi was associated. The party would do well to remember, however, that her welfare economics – right to education which meant no tests till Class VIII, right to food providing subsidized grains to 65 per cent of the people – did not help the party in 2014. Instead, the people fell for Modi’s promise of jobs and if he is in trouble today, it is because of the bleak employment scene. The Congress’s focus, therefore, should be on rejuvenating the economy rather than on freebies and bovines. As of now, however, the Congress has been engaged in catching up with the BJP rather than delineate what it stands for. It is in this respect that Rahul Gandhi’s lack of political maturity is in evidence because he appears to be stuck with the Rafale deal rather than use it as just one stick with which to beat the government while dwelling on its other failures. Considering that the BJP vs Congress battle is becoming a presidential one with Modi and Rahul Gandhi being virtually the only contestants since no other opposition leader is ready to take on the prime minister as consistently as the Congress president is doing, it is imperative for the latter to outline his vision for India. The vision should be on a liberal, tolerant, multicultural nation where the people can live as freely as they want to in the matter of eating, dressing, reading and seeing movies of their choice. At a time of frenetic saffronisation — defying the judiciary on temples and erasing Muslim names — the Congress has to reiterate what Nehru said about India being a land of many faiths where no one religion should dominate.